Another year is almost at an end, and I’m starting to think about what I accomplished this year. But before I write my year in review I have to fill you in on what’s happened since the end of October. Haikuniverse published another Halloween haiku of mine on Halloween. This is the second year I’ve submitted to their call for Halloween poems. I enjoy writing Halloween poems, and I hope to be able to submit again next year. frog song . . . 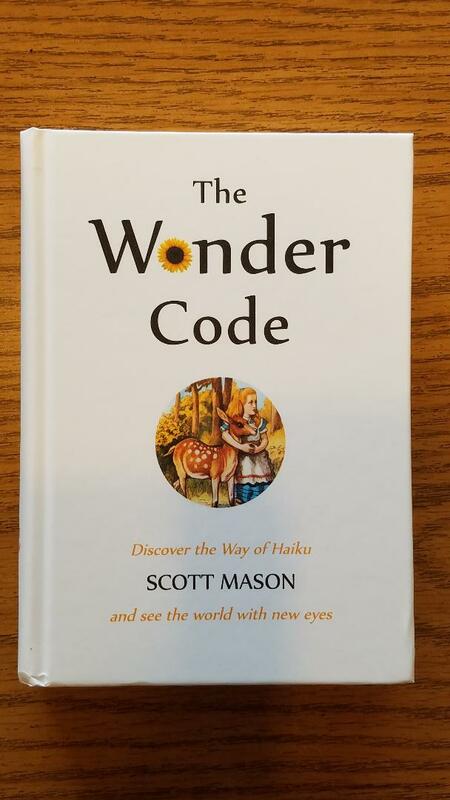 I recently received a copy of a brand new anthology edited by Scott Mason called The Wonder Code. Scott Mason has written the essays in a way that is welcoming to those new to haiku. So far I have read only the parts of the book where my work appears (I have four poems included). My favorite of these sections is chapter 2, “Come to Your Senses.” This chapter is about how cell phones and other handheld devices are a distraction from real life sensory experiences. I especially liked the Nick Virgilio quote, who said that he wrote haiku “to get in touch with the real.” It’s true what Mason says about people spending too much time in front of a screen. It’s also true that the Internet provides information and access. I live in a small town, hundred of miles from the nearest shopping centers, and I know firsthand how much access the Internet provides. The Internet has always been the place I got my information about the haiku world. And lately I have been questioning my comfort level with how much of me is on the Internet and on social media. Definitely though-provoking material, and I look forward to reading the rest of the anthology. The haiku in this anthology were all pulled from The Heron’s Nest where Mason is an associate editor. The Wonder Code makes for a great companion volume to Nest Feathers, a retrospective anthology of the first 15 years of The Heron’s Nest. The fact that there are now two anthologies available where all the haiku come from the same journal is a testament to the quality of work published in The Heron’s Nest. Many thanks to Scott Mason for including some of my work in such a great anthology. Many thanks to Fay Aoyagi and the rest of the editorial team for publishing my work. In Scott Mason’s book I really liked Chapter 2 as well, especially the paragraph about how a visual fragment can clear the way for a non-visual sense. I think Chapter 3 was the longest and I liked it too. The section describing various associations that go along with the seasons was insightful for someone new to haiku like myself. I started writing haiku 4 months ago and was pleased to get acceptances into the Haiku Foundation’s Workplace Haiku blog, Bones Journal, and one for the next issue of Modern Haiku. You’re off to a great start after only four months. Keep up the good work, and thanks for stopping by my blog! Those are really good. Great job Chad.